Everyone is talking about the cold this week, but last summer we were all talking about the rain. Nearly a foot of precipitation fell on Southwest Wisconsin in late June, 2013, when basements flooded and rivers overran their banks. 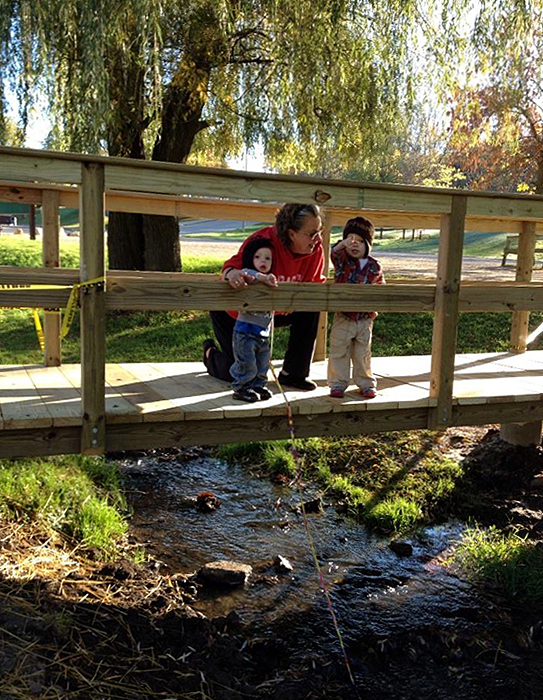 Mineral Point’s own Brewery Creek washed out the bridge at Kitto’s Crossing, causing Dodie Baker to take action. 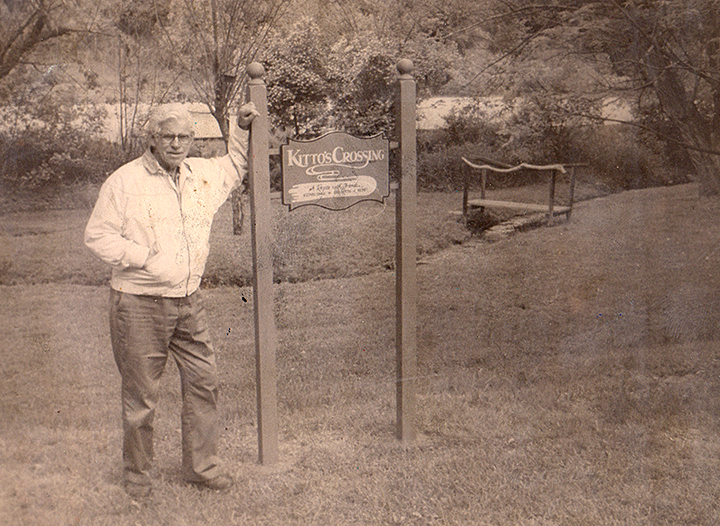 Dodie’s father (Bill Kitto) built the first bridge nearly four decades ago. 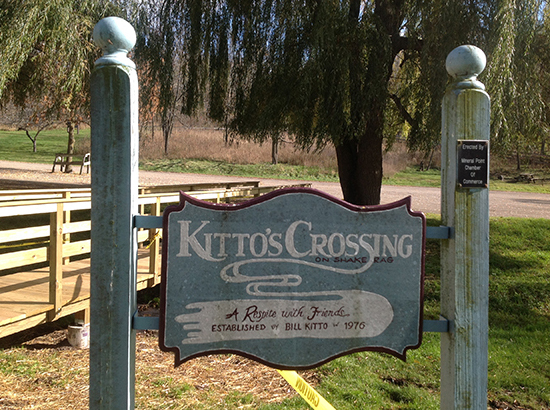 The bridge and property, labeled “Kitto’s Crossing” in honor of her dad, are part of Pendarvis State Historic Site. HSB: After the bridge washed away, you acted immediately. Dodie Baker: I would never have started a Facebook page, but I was so worried that the community was going to lose that bridge. Families have come for years having their pictures taken, having fun in the creek. At first Pendarvis didn’t seem like they were going to have any money to fix it, but they came through. They were able to get it funded and they hired Curt Knutson and his team to come up with a design and build it. Everyone came through with flying colors. My first reaction was “Oh my God, we have to have a whole community project to rebuild it. Then it didn’t have to happen (because of Pendarvis funding the project). But I’m glad I did the Kitto’s Crossing Facebook page, because it raised awareness of the bridge and what had happened to it. HSB: How did your dad get involved with building the bridge? DB: He was curator of Pendarvis starting in the early 1970s, and was in charge of the grounds. Shortly after the parking lot was put in he decided that instead of having people walk along the street, he’d add a bridge to go across to make it a little more fun. The space was wildly overgrown before that. HSB: So the bridge that washed away wasn’t the first bridge? DB: No, he built some earlier, more primitive bridges. 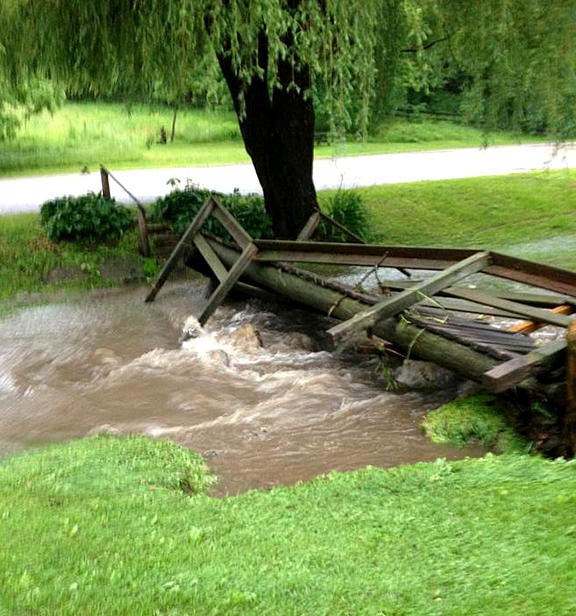 There have been a number of years when the bridges have been washed out. 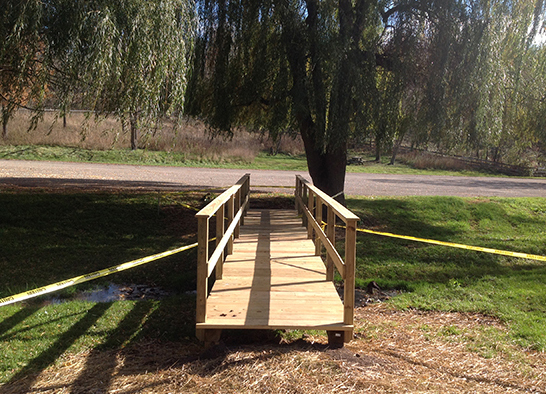 The bridge that just washed out in 2013 was put there by the Wisconsin Conservation Corps, and was at least the third bridge on the site. Thank you, Dodie, for speaking to High Street Beat, and thanks for your effort in preserving this treasured piece of Mineral Point. This entry was posted in Architecture, Family, Outdoors, People and tagged Curt Knutson, Dodie Baker, Kitto's Crossing, Mineral Point, Pendarvis, Wisconsin. Bookmark the permalink.